Cut the ends off the garlic bulbs to expose the cloves. Drizzle with EVOO, season with salt and pepper, wrap in foil and roast to tender, 40-45 minutes. Remove the garlic and reduce the heat to 350°F. Heat a large Dutch oven over medium-high heat. Add a drizzle of EVOO and the bacon. Brown and crisp the bacon, then remove and reserve. Pour some of the fat out of the pan and add a couple of tablespoons of butter. Pat the meat dry and season liberally with salt and pepper. Dredge in the flour and add to the hot pot in batches. Cook to crispy and deep brown. Add more butter as needed, 2 tablespoons at a time. Reserve the browned meat with the bacon. Add the carrots, apples, celery, onion, bay leaves and salt and pepper to the pot and partially cover. Cook to soften the vegetables for a few minutes, then sprinkle with 2 tablespoons flour. Stir for a minute, then add the cider, consommé and the roasted garlic cloves and stir to combine. Add the reserved beef and bacon back to the pan, bring to a boil, then cover and transfer to the oven. Braise the meat for 2 hours, until very tender and the sauce has thickened. Let stand for 20 minutes while you cook the potatoes. Boil the potatoes and parsnips in salted water until tender. Drain and return to the hot pot; mash with 2 tablespoons butter, cheese and the milk. Season with salt, pepper and nutmeg; stir in the chives. 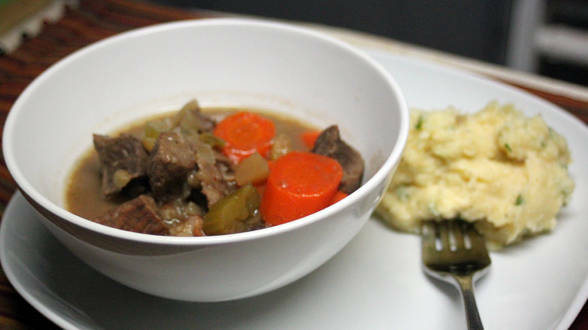 Serve the stew in shallow bowls with the potatoes alongside. In Recipes-list.com we have selected the most viewed recipes from category - uncategorized . Enjoy the best recipes specially selected for you! Autumn Beef Stew with Apple, Onion and Roasted Garlic is the right choice that will satisfy all your claims.